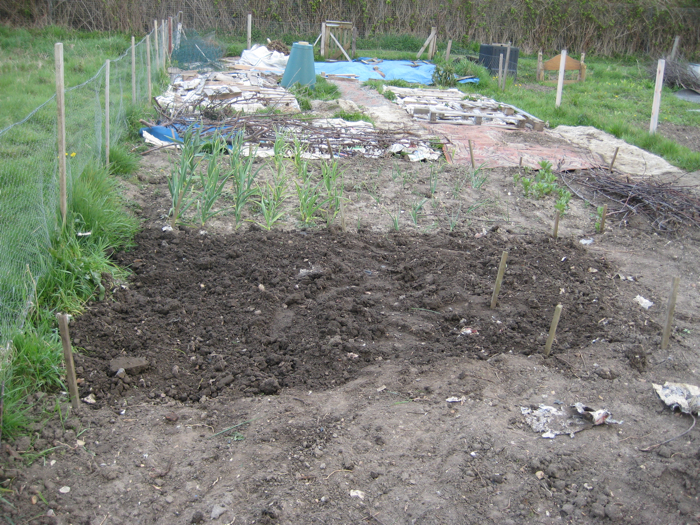 2nd April 2012, at Allotment Plot 326 the parched Earth was resigned to the tight grip that Drought had on the soil. The grip was in the process of tightening. The soil was cracking. 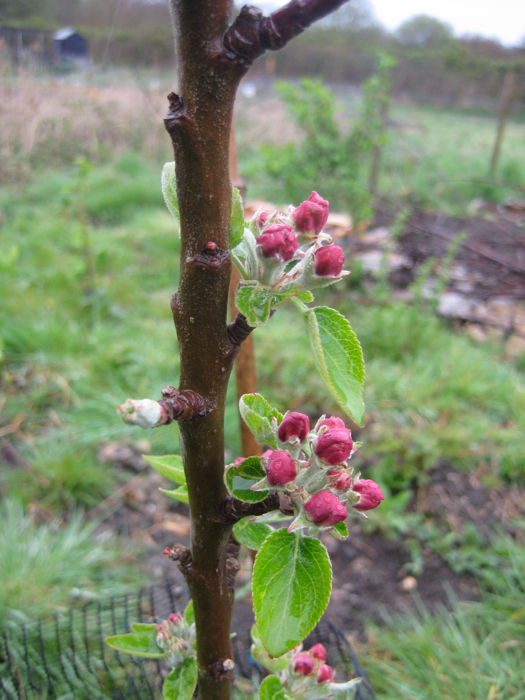 Blossoms enclosed in tight buds were forming on the fruit trees and bushes, but the young Plum Tree, planted a year ago on the Plot, looked like at some point in time it had died. 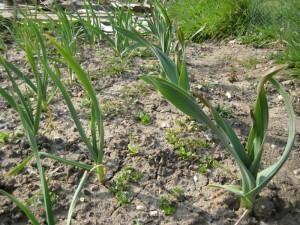 The over-wintered Garlic continued to grow, but the Onions were very thin and faltering. Broad Bean foliage looked uncertain. Water levels in rivers, lakes and human-made reservoir storage facilities were very low. Rain needs to fall in the winter months to really soak the ground. Any rain that falls in the summer months evaporates again too easily or floods because it cannot be absorbed quick enough in to dry ground. Soil was uncovered and prepared. 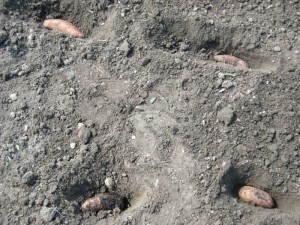 Potatoes were planted in trenches. Ella Montt saw a Toad climb across the disturbed earth. The Toad headed for some cardboard and disappeared in to concealment. Worms extended their bodies across the soil and sank back in to its hidden depths. 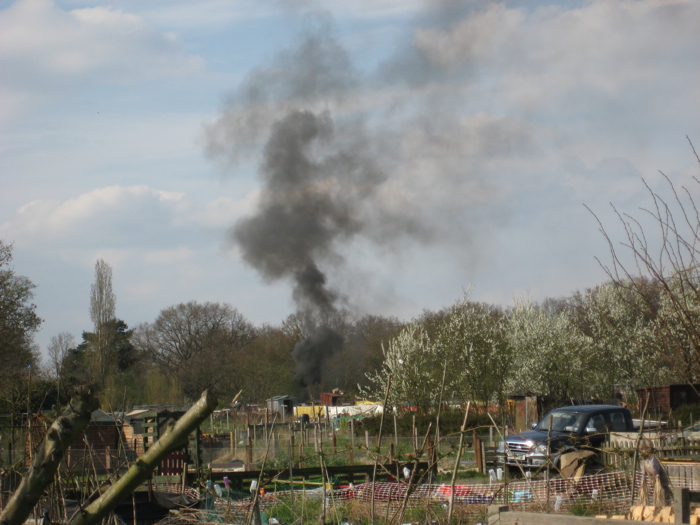 Black smoke rose in to the air from somewhere across the Allotments. A waft of unpleasant aroma moved through the air producing a smell of incinerating plastic or some other unidentified entity. Seeds planted = Potato Red Duke of York and Nicola. 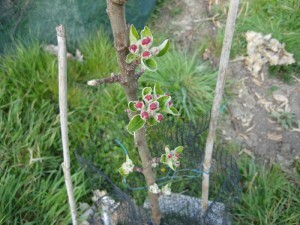 9th April 2012 – Allotment Plot 326, the fruit blossoms were close to opening. More potatoes were planted. The Hose Pipe ban had come in to affect, yet it had rained. Seeds planted = Potato Desiree. 12th April 2012, at Allotment Plot at MERL Ella Montt weeded the Plot. The plant residue was placed in the Brick Composter. It had rained after the Hose Pipe Ban came in to affect, but this did not mean that the drought was over. The two-winter drought had depleted stores of water and rivers. Rain in winter seeps in to the ground. Rain in the summer months may not build up the water reserves and reverse the drought; because it is warmer the moisture evaporates more easily. Ella Montt started to cut the bamboo in to 110cm lengths. 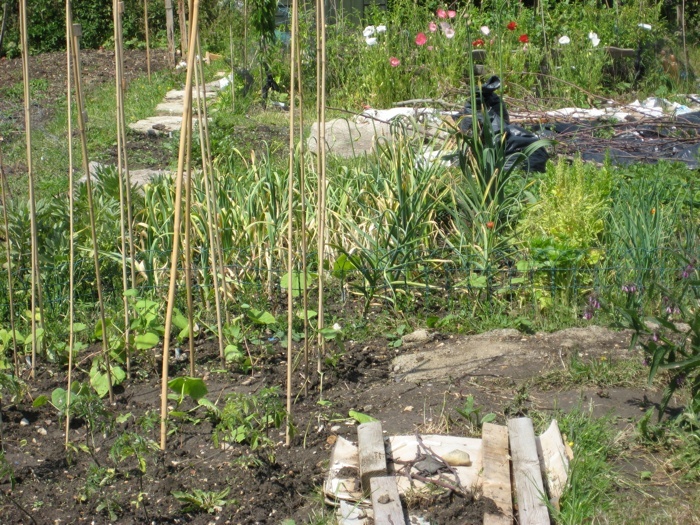 The bamboo was pushed it in to the hard ground to erect supports for the Pea plants. 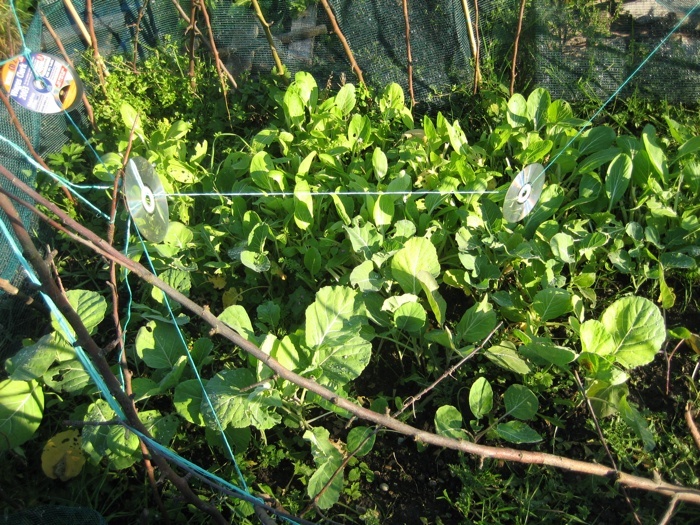 A net structure was tied between the supports for the Peas to cling on to. Seeds planted: Cucumber Tanja x 6, Marketmore x 6; Melon Sivan Fi x 6; Courgette Black Beauty x 12, Gold Rush x 5; Marrow Long Green Bush x 4, Sunburst F1 x 5, Tigers Cross x 5; Pumpkin Mars x 6, Giant Atlantic x 4, Connecticut Field x 4 ; Squash Big Max x 3, Twonga x 6. 16th April 2012, Allotment Plot 326, now the fruit blossoms were bursting open, but the Plum tree stilled seemed dead. More potatoes were planted and other seeds. The soil was dry, the earth parched, even after April showers. Seeds planted: Potato Charlotte; Onion Red Baron x 250g; Broad Bean Hangdown Green x 20; Brussels Sprout Groninger; Leek Blue Green Winter; Carrot Rodelika; Beetroot Bolivar. 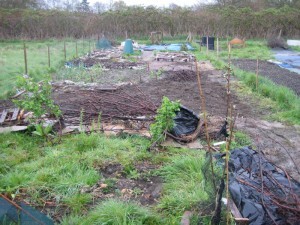 20th April 2012, at Allotment Plot at MERL the soil looked more moist. The showers of April seemed as though they had jumped back in to synchronicity and a more expected rhythm. 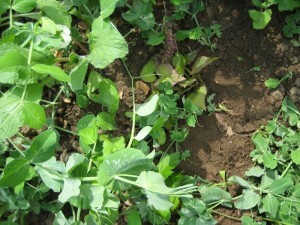 Ella Montt examined the Plot for evidence of wildlife consuming the vegetable seedlings as they emerged from the soil. Sometimes there was no evidence; plant material vanished without any trace. 30th April 2012, by the end of April rainfall had accelerated in to a sudden deluge. The ground under the surface was still parched and hard, so the water in some places flooded. Within a matter of days it became the wettest April on the Island in over one hundred years. Once again there was an experience of extreme weather. 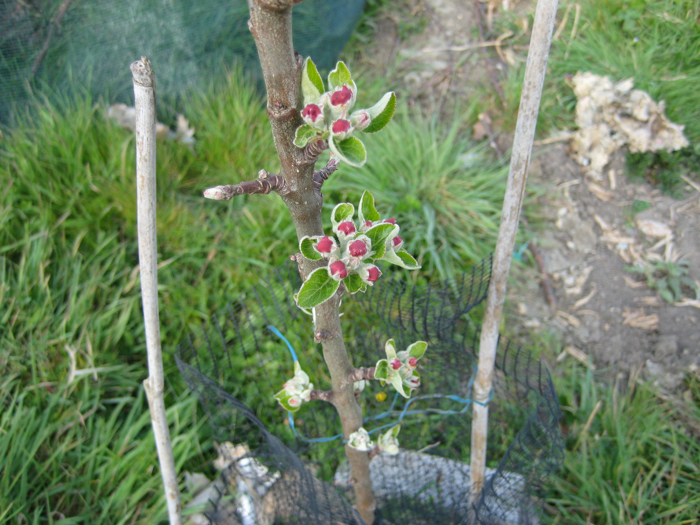 This entry was posted in Allotments, Drought, Exteme Weather, Rain and tagged Drought, Fruit Blossom, Rain, Seeds, Sweet Potato on April 30, 2012 by katecorder. 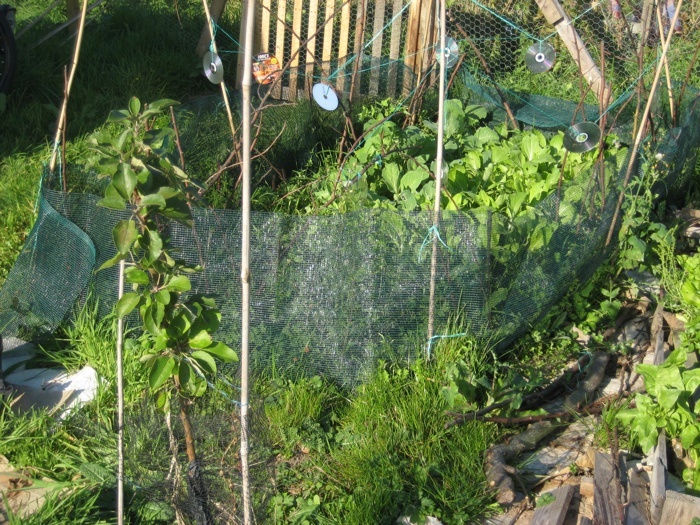 7th October 2011 – At Allotment Plot at MERL, there was an overload of sound at the Plot. The sounds penetrated and reverberated across the garden. Magpies were conspiring in the trees, planes moving along flight paths, teenagers screaming and shouting involved in the action of sport in a field beyond the hedge, sirens wailing, one after the other, the sounds repeated and echoed again and again. 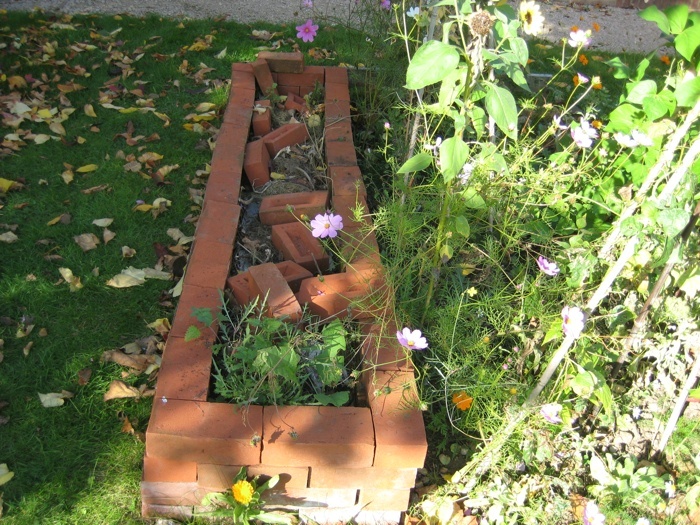 The Brick Composter had collapsed in on itself; the top layer of bricks had fallen in to the compost. Ella Montt adjusted the bricks back in to position. A tan coloured fat slug was at rest in amongst the compost. The second yellow squash was in the process of dying, the first had already died, it was partially eaten and the rest in a state of decomposition. 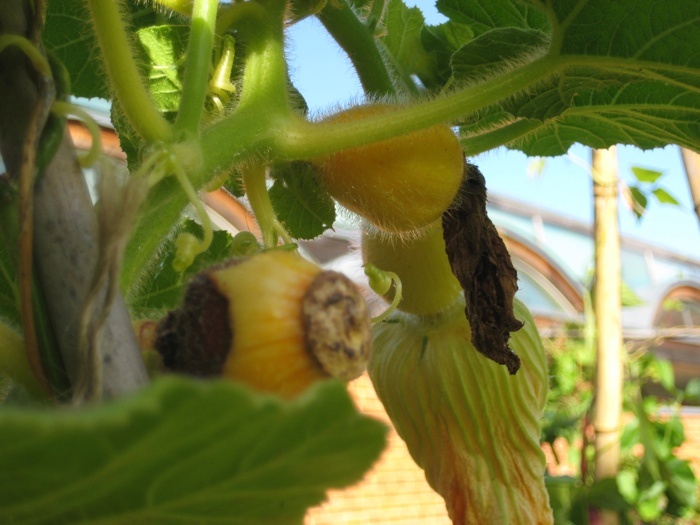 A third squash fruit seemed okay for the time being, the fourth seemed strong and had a robust flower, a fifth was trying to emerge, but none, because of the time of year, would last long enough to become substantial. The day was breezy with an Autumnal nip in the air, after a dark morning, some blue sky had emerged and the clouds, blocked and then unblocked the sunshine. The human discontent was progressing with more protest through the occupation of space (New York City 99%). The space is not cultivated just occupied. Perhaps all city space in general needs to be squatted and become cultivated through the growing of vegetables and fruit to disconnect the merchandise from the power of commodity and the obsession with economic growth. Land needs to be shared along with wealth, but at the same time the commodity needs to deconstruct itself so that resources are not wantonly depleted. It is time to plant over the concrete; every city needs to be a garden of vegetation. A city can function with more sustainability than a rural dwelling, because of the shared utilities of the human activity, yet the increase in heat generated by the human activity amassed in the cities is increasing the hyperobject of global warming. The winter of discontent is looming and its harsh reality will be felt in the streets when the temperature drops, yet first the Autumnal Fall needs to be completed before the Winter cycle. The discontent is unlikely to dissolve, the fat slug sits untouched in the compost, and all the while the extremes of drought and starvation are felt in Afghanistan and Africa. Harvest: Tomatoes = 3.5oz = 90g; Companion Planting Seeds, Calendula Pot Marigold, Cosmos Cosmea, Cosmos Orange Cosmea, Chamomile, Sunflower and Mint; Celery Tall Utah = 5oz = 140g; Chard = 1oz = 30g; Beans (Runner) Enorma = 14oz = 400g; Beans (French Climbing) Neckarqueen and Blue Lake = 2oz = 60g, Blauhide = 1.5oz = 40g, Barlotta Di Fuoco = 10.5oz = 300g. 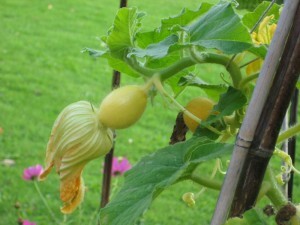 On the 10th October 2011 the size of this years Squash and Pumpkins was a news item on a radio program. 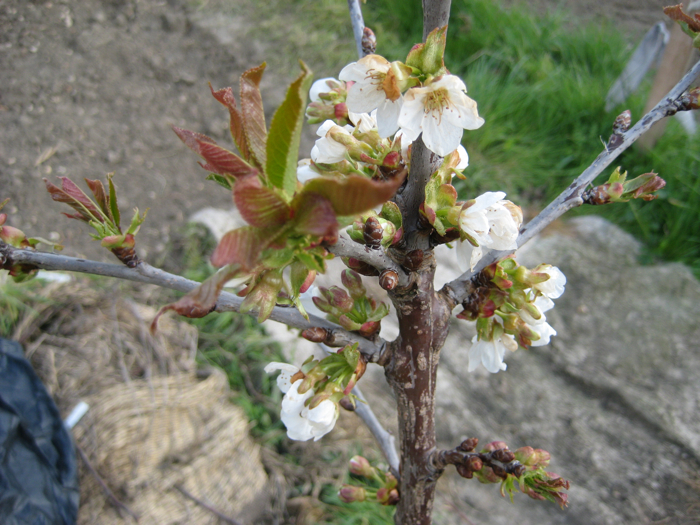 The conversation focused on the fact that the cold nights in June delayed the growth of the plants leaves so that they were not nearly developed enough by July. The temperatures then did not contribute enough to allow the plants growth to catch up, resulting in many of the Squash and Pumpkins being lighter than they would be normally at harvest time, (that is if they grew at all). Ella Montt had found some of the Squash plants at Plot 326 started to grow in September only to be thwarted once again as soon as the temperature dropped. 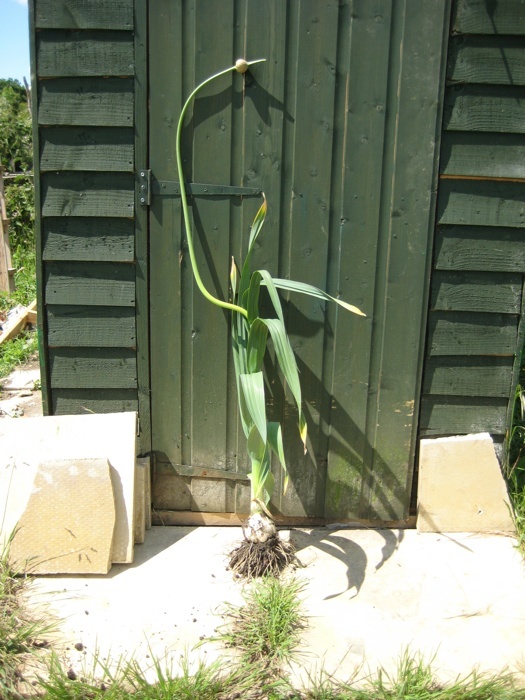 The Sweetcorn plants had also barely grown. Harvest was minimal. 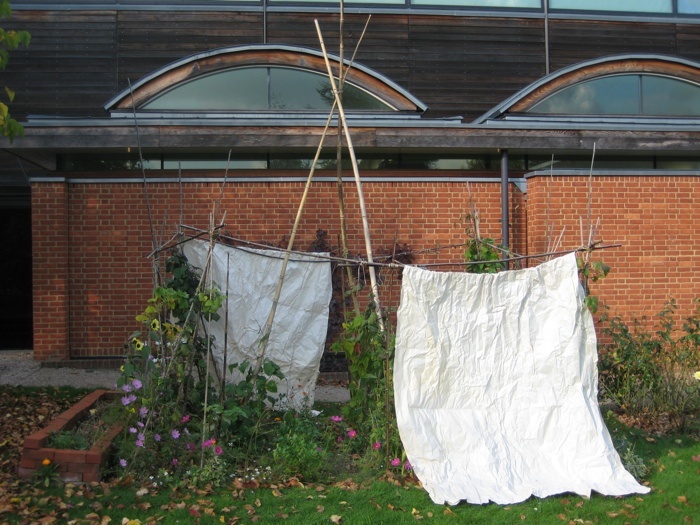 13th October 2011 – Allotment Plot at MERL, the day after the Moon was waxing gibbous, Ella Montt attached curtains of newsprint paper to the Bamboo Frame around the Plot. Ella Montt gazed through the camera lens at the partially covered Plot, there was no sense of Jeanne-Claude and Christo, but a more Fluxist act of temporality as the paper hung in the air. The Plot as an object was explored. Ella Montt knew that in an augenblick the paper curtains could be removed and placed in the Brick Composter to become compost material, overtime the deconstruction of the paper would leave no visual trace or relic, and would become soil. The newsprint, a seemingly low tech product, had once been part of a plant tree that had originally grown out of the soil, the tree had been deconstructed and reconstructed in to the newsprint through a process involving high technology. The manufacturing of paper can be constructed by human hand, but it is more normal for machines to make paper from trees. The string that attached the paper curtain to the Bamboo frame was also originally a product from a plant, reconstructed for human needs. The weather that day in October was pleasantly warm in temperature, with a slight breeze. It was neither hot nor cold. Small clouds drifted by in a blue Autumnal sky. The third yellow Squash fruit was in the process of dying. The fourth had not yet reached that stage and at this point still had life potential, but it was too late in the season and the inevitable premature death of the Squash fruit loomed. The harvest today would be minimal. When darkness falls Ella Montt will be gazing beyond the blueness of the sky towards far distant star configurations, wondering when the time will be right to plant next years Garlic. Harvest: Companion Plantings Seeds = 1oz = 20g; Beans (French Climbing) Barlotta Di Fuoco = 6oz = 180g; Celery Tall Utah = 7oz = 195g; Tomatoes = 3.5oz = 95g; a mix of the other Beans including Enorma and Blauhide = 7.5oz = 240g and Sweetcorn True Gold = 5oz = 140g. 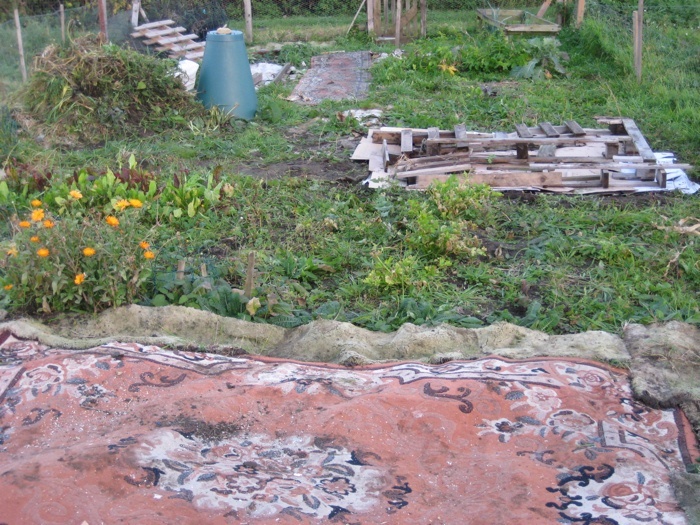 14th October 2011 – Allotment Plot 326 – As if by magic a new carpet had appeared and covered an expanse of soil that had grown the potatoes this year. Ella Montt cut more vegetation and added it to the compost pile that is accumulating. Harvest: Squash 1 x Sweet Dumpling 6oz = 175g, 1 x Sweet Dumpling = 5oz = 140g, 1 x Blue Kuri = 2lb 5oz = 1.05Kg, 1 x Green Hokkaido = 2oz = 50g, 1 x Green Hokkaido = 12oz = 345g, 1 x Acorn = 1lb 8oz = 690g; Sweetcorn True Gold = 6oz = 175g; a mix of Beans = 1lb = 440g; Oriental Tai Sai = 11.5oz = 330g; Courgettes = 3 x Cocozelle = 9oz = 250g, 2 x Patriot F1 = 10oz = 280g; Perpetual Spinach = 7oz = 200g; Rainbow Chard = 7oz = 200g; Kale Red Russian Curled = 3.5oz =90g. 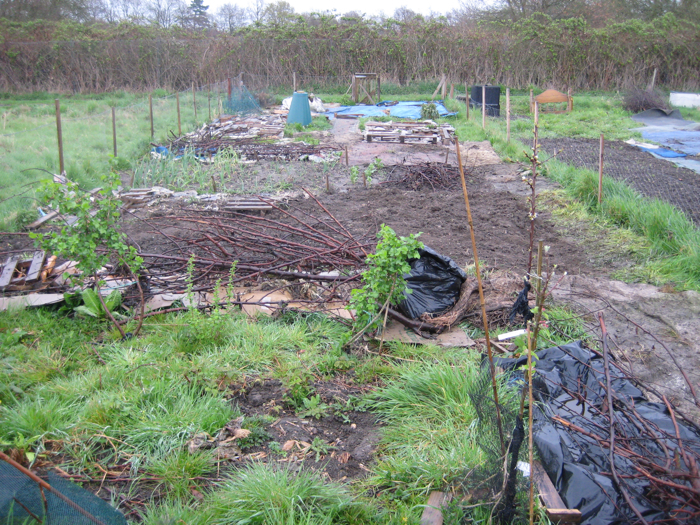 19th October 2011, Ella Montt went first to Allotment Plot at MERL and then to Allotment Plot 326, Frost was forecasted for that night and fear of plant loss was projecting itself across the land. At Allotment Plot at MERL the sky was dark, tiny Blauhide Beans were forming after the recent warm weather. The most recent Squash was still intact, but the previous one that had been growing, was rotting next to it on the vine. Ella Montt gathered Companion Planting flowers to save them from Frost destruction. The flowers would be pressed secretly and then attached to tree product thin card. Harvest: Celery Tall Utah = 6oz = 165g. 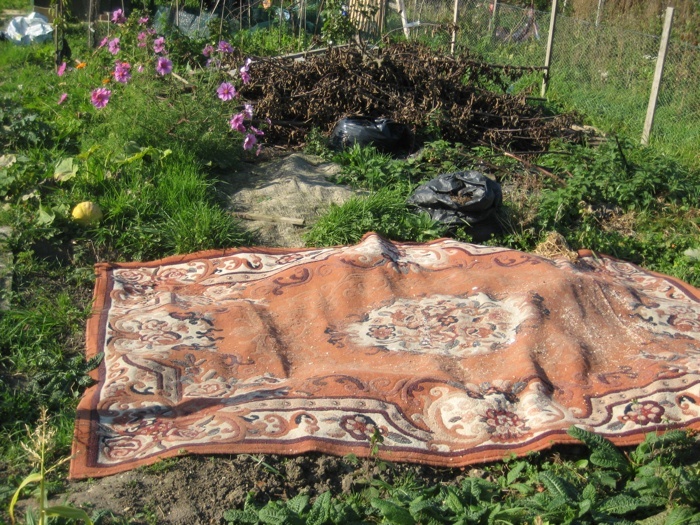 On arrival at Allotment Plot 326 Ella Montt found that she was already too late. 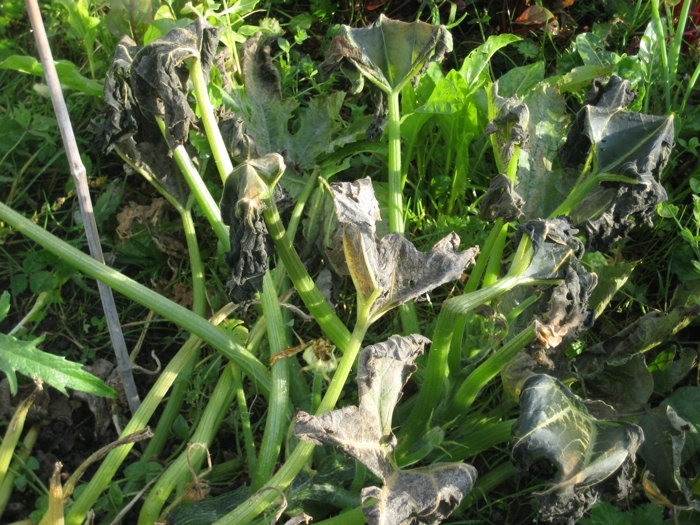 The temperature must have plummeted on a previous night, already the leaves of the Courgette and Squash plants had turned from green to black and were curled in on themselves in an alien configuration. The Globe Artichoke plants were so far unaffected by the drop in temperature, Ella Montt had no previous experience in growing this type of plant, so uncertainty hung over their longevity. If the plants could keep growing and do not perish, next year they may produce artichokes. A Frog hopped by. If the Frog wanted to survive the Winter it would need to hide itself somewhere to avoid being frosted. Harvest: Celery Tall Utah = 7oz = 195g; Squash 1 x Sweet Dumpling = 12oz = 345g, 1 x Green Hokkaido = 6oz = 165g, 1 x Green Hokkaido = 3.5oz = 75g; Rainbow Chard = 1.5oz = 40g; Oriental Tai Sai = 2oz = 60g. 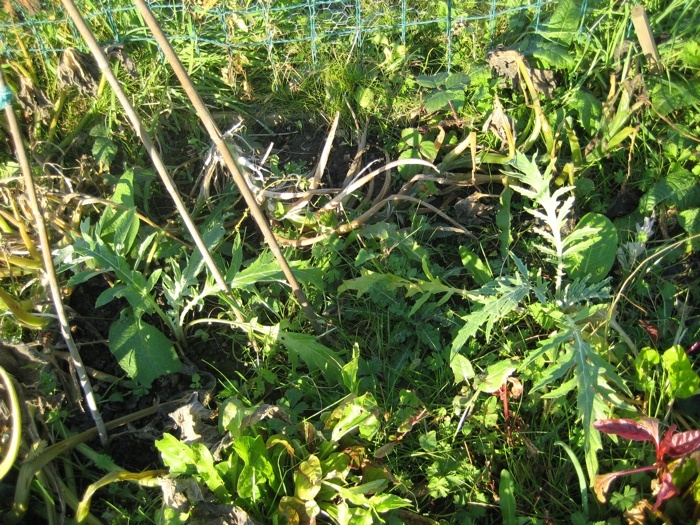 The next day, on the 20th October 2011, at Allotment Plot at MERL, Frost had not appeared in white frozen form. 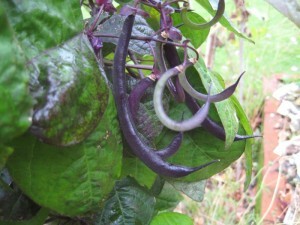 The tiny Blauhide Beans remained unharmed attached to purple flowers. 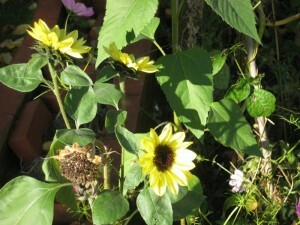 The Cosmos Cosmea and Sunflowers still bloomed. There was no sign of a zero temperature, it had been close, yet luckily, for the time being, the Plot was sufficiently sheltered from the elemental forces. 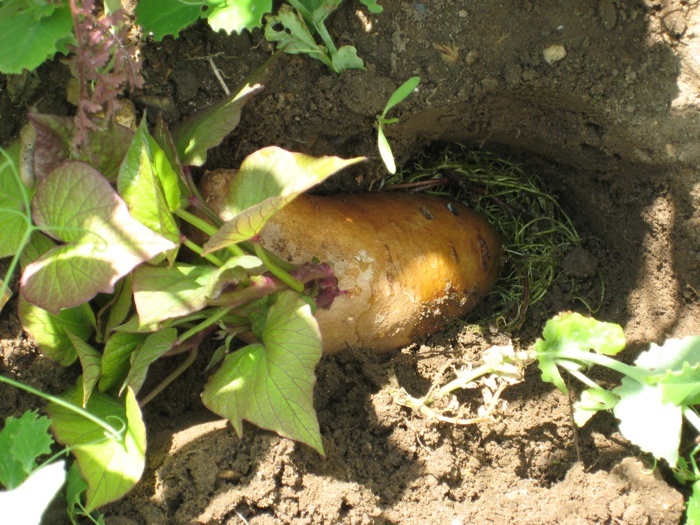 27th October 2011 – Allotment Plot at MERL – Ella Montt dug up the Sweet Potato. The tuber vine plant had not spread in all directions as anticipated for, but instead was becoming trapped by the rhizome growing Mint plant that is extending itself in the form of horizontal runners punctuated by vertical shoots of new foliage structure. The Sweet Potato was surprisingly still in one piece. The Slips had tiny tubers growing from them. 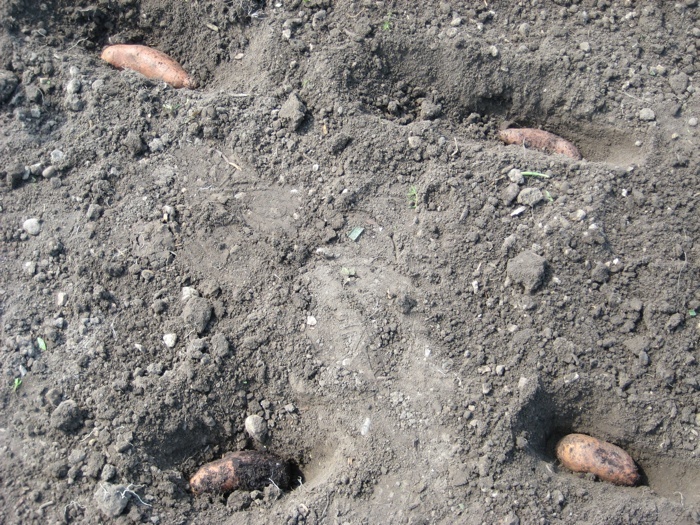 Ella Montt divided the Sweet Potato Slips and replanted them close to the original tuber. It would be an ecological miracle if the Sweet Potato will survive a harsh winter, but perhaps the Slips would establish themselves and extend roots beyond the Mint invasion. It was a dark dull Autumnal day, the grey clouds were heavy, but moving fairly rapidly considering their weight, the threat of rain held off, but not in Thailand or Dublin where it was flooded. Sweet Pea seeds were embedded in the soil next to the Bamboo Wigwam. A Heavy Metal CD had broken. The Squash plant that in recent weeks had tried so hard to produce was slowly meeting the end of its life expectancy. Celery and Parsnips were dug out of the ground, Mint and Rocket gathered. Phacelia Tanacetifolia was broadcasted across the Plot. 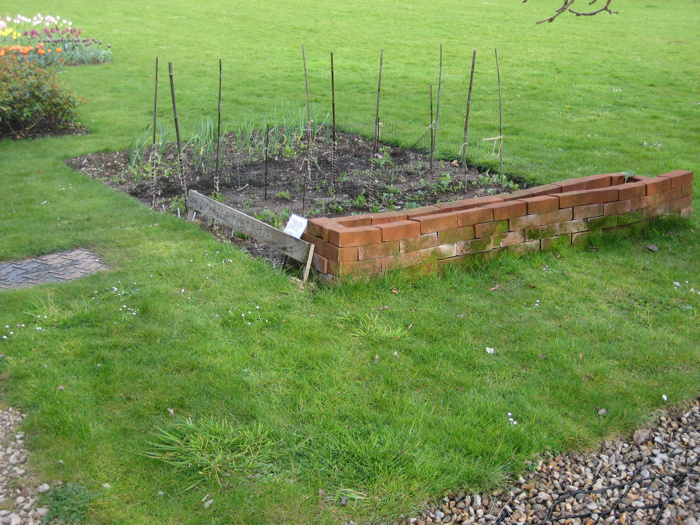 The first rows of Broad Bean Aquadulce Supersimonia were planted about 8-10 inches from the Brick Composter, this was followed by planting rows of Broad Bean Superaquadulce and then Pea Meteor. The over wintering planting had begun. Harvest: mix of Beans = 5.5oz = 160g; Mint = 3oz = 80g; Rocket Esmee and Wild = 1.5oz = 40g; Parsnip Halblange White = 7oz = 200g; Celery Tall Utah = 7oz and 200g. 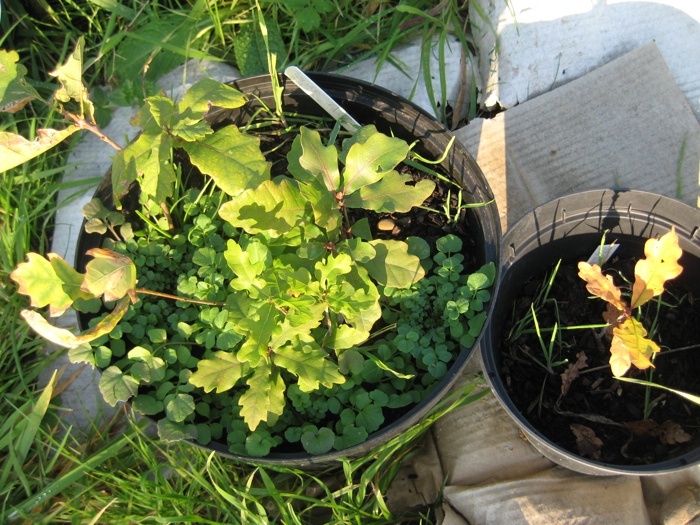 28th October 2011 – Allotment Plot 326 – The potted Oak Tree seedlings found on the Plot were experiencing their own Autumn. Ella Montt cleared the dead Beans, Sweetcorn, Courgette and Squash plants to the Compost Pile that had been expanding gradually since it was uncovered a month or so ago. It was anticipated that some of next years Squash plants would be planted on the compost. A Frog was seen amongst the Tai Sai. Perhaps a small pond needs to be dug for the Frog? (This idea is under consideration, but needs to be in a bramble root free area). Ella Montt fetched the fork from the shed, not to dig the pond, but to work over an area of soil that had been cleared of vegetation. It was a perfect day to dig; the temperature was just right, not to cold or hot. 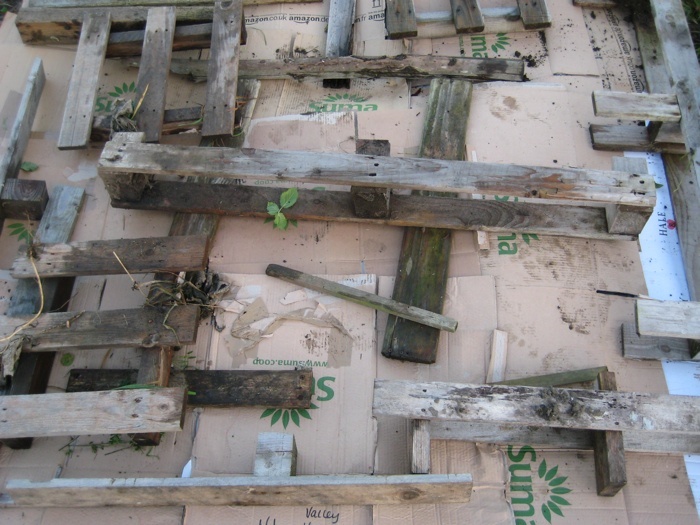 When the area had been worked over it was covered with layers of tree products, newspaper and cardboard and weighted down with pieces of wood. 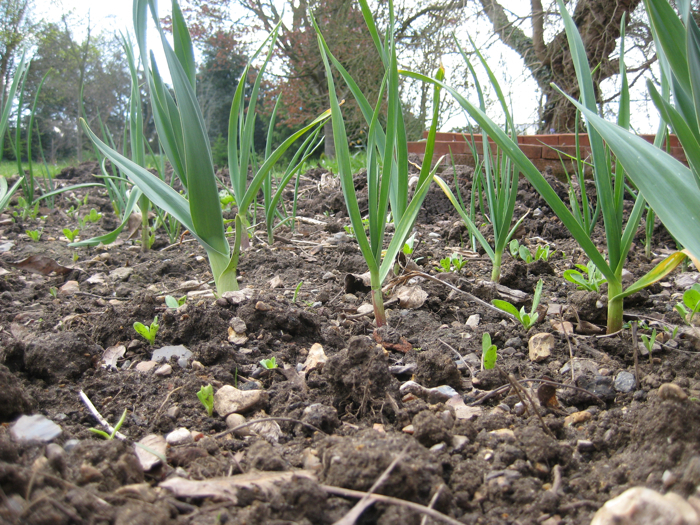 This soil will now be left until early spring. The layers of tree products covering the soil would assist in weed suppression and encourage worms to break down the matter underneath the covering so that it would be ready to plant without much work in the Spring. The cardboard will also offer space for the Frog to shelter under if needed. Harvest: Perpetual Spinach = 3oz = 80g; Kale Red Russian Curled = 1.5oz = 40g; Oriental Tai Sai = 6oz = 160g; Rainbow Chard = 2oz = 65g; Carrots Autumn King = 8oz = 230g. 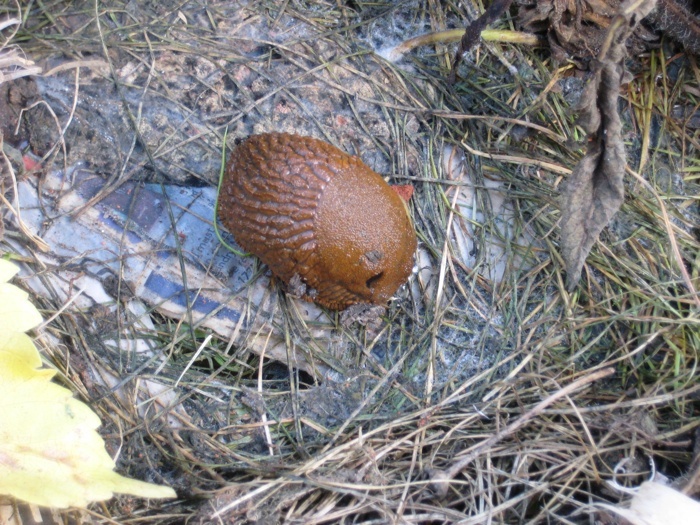 This entry was posted in Allotments, Compost, Digging, Hyperobject, Plot and tagged Artichoke, Autumnal, Compost, Fluxist, Frog, Frost, Human Discontent, over wintering, Squash, Sweet Potato, Tree Products on October 29, 2011 by katecorder. 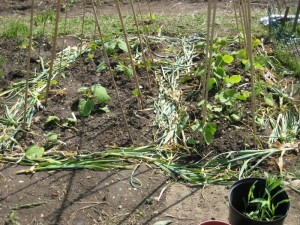 11th June 2011 – Allotment Plot 326 – It was necessary to harvest the Garlic, Onions, and the rest of the Broad Beans. Garlic and onions were dug out of the soil. 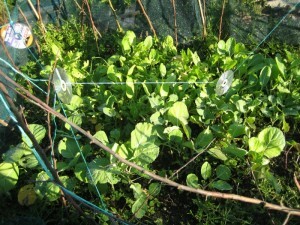 The remainders of the over-wintered Spinach that had gone to seed were removed. Last night there had been a hail storm followed by heavy rain, but it was very localized and might not have occurred at Plot 326. Harvest: Broad Beans = 1lb 8oz = 700g; Spinach 7oz = 200g; 106 bulbs x Onions (White) Swift = 9lb 8oz = 4.33kg; 33 bulbs x Onions Red Baron = 2lb 5oz = 1.4kg; 3 bulbs x Elephant Garlic (1) 2lb 5oz = 1.4kg; 16 bulbs x Dukat Garlic (2) = 11oz = 760g; 25 bulbs x Sprint Garlic (3) = 3lb = 1.36kg, (5oz = 120g of Sprint Garlic had previously been harvested on 25th May, because the elements were making the plants deteriorate); 16 bulbs x Thermidrome Garlic (4) = 2lb 4oz = 1kg. 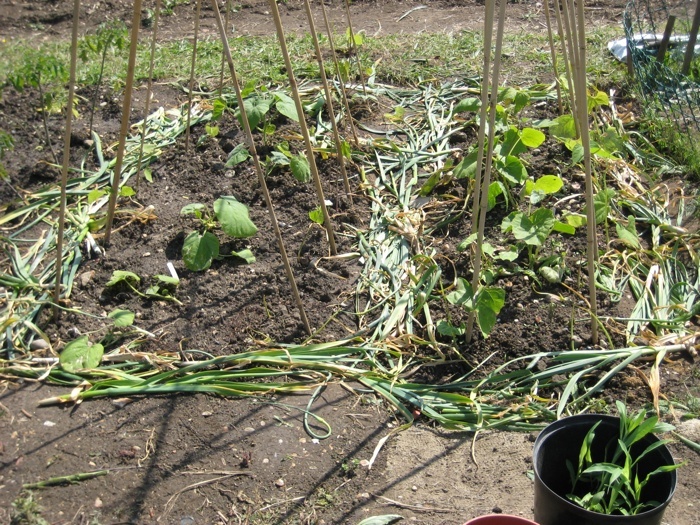 The Garlic foliage was cut away and the leaves arranged around the Climbing Bean plants to try to ward off rabbits, snails, and slugs. 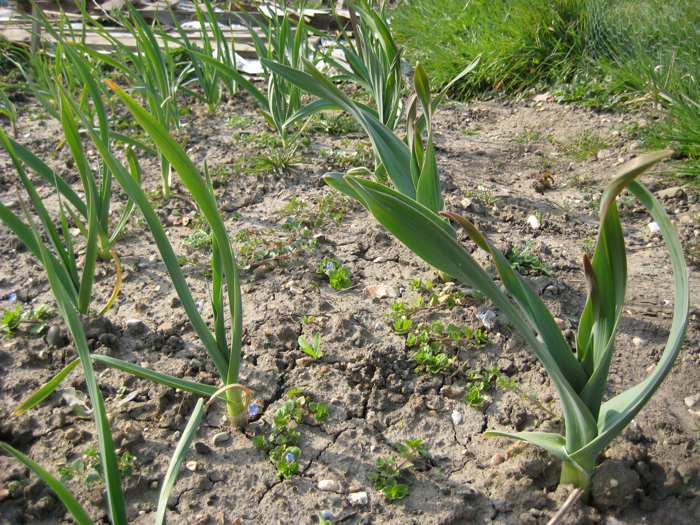 The Shallots were left to continue growing, because the bulbs were still small in size. Ella Montt transplanted seedlings that had been grown in the fixed up greenhouse, these were, 12 x Sweetcorn True Gold; a number of Celery Tall Utah and Celeriac Ibis; 4 x Sweet Potatoes that had the potential to activate rhizomatic growth within the Allotment Plot. Next Ella Montt planted out 3 x Artichoke Imperial Star; 6 x Tomato Plants, which were, 3 x Koralik (a bush Tomato), 2 x Brandywine and 1 x Chadwick (these last two are both tall Tomatoes as is the Marmande). 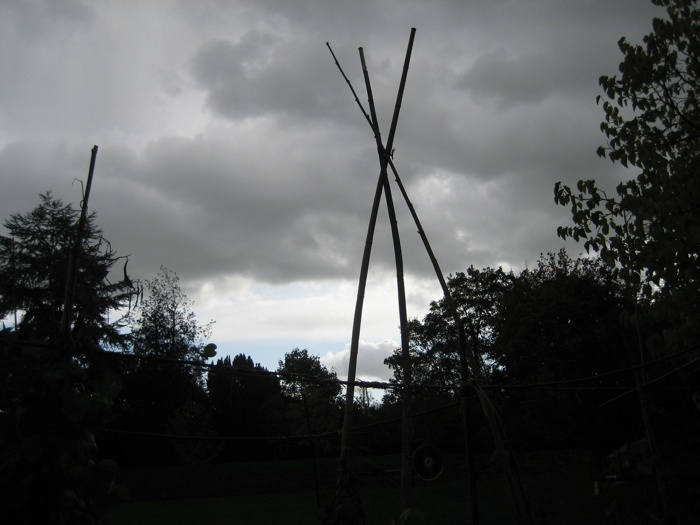 Whilst Ella Montt sheltered in the shed doorway, a shower of rain dampened the ground, watering the plants. 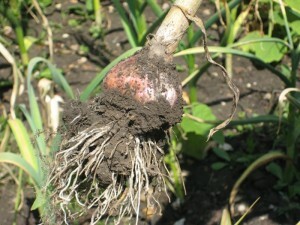 This entry was posted in Allotments, Harvest, Planting and tagged Allotments, Garlic, Harvest, Plant Life, Plot 326, Rain, Sweet Potato on June 26, 2011 by katecorder. 19th May 2011 – Another transplant was performed. The sprouting Sweet Potato and Comfrey that had been growing roots in the studio left the holding area and transported to Allotment Plot at MERL. 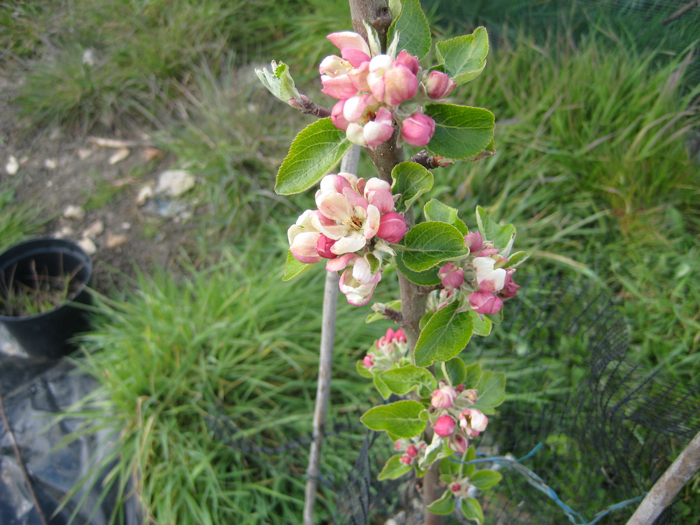 Other plants were also relocated from the fixed up greenhouse to new positions on the Plot. These plants were: 1 x Melon Sivan F1, 1 x Marrow Long Green Bush, 1 each of Cucumber Marketmore and Tanja, 1 x Courgette Soliel F1, 1 each of Squash Red Turban, Blue Ballet and Butternut. Rain water was still persistently absent from the Plot and it was necessary to fetch the watering can from the shed. Last weeks transplanted Squashes and Courgettes although they had survived, needed reviving, Ella Montt added a seaweed concentrate to the water and doused the Plot. The Climbing Beans were not looking vigorous. 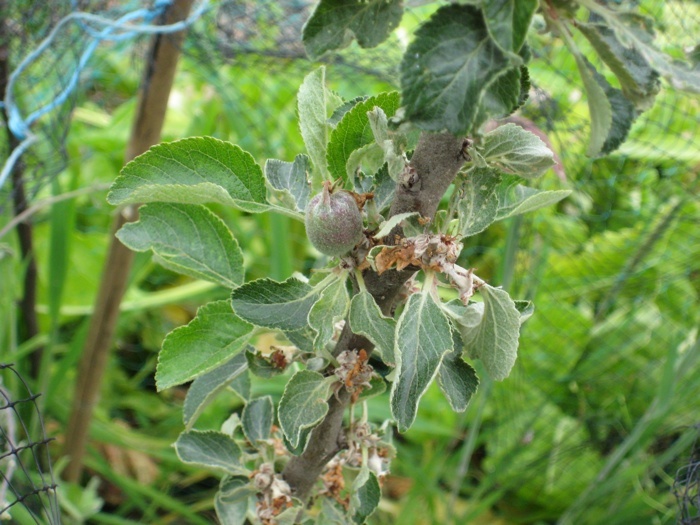 The weather conditions since mid March have been unusual for the time of year and sometimes deceiving, because of the long dry spells and consistent sunshine, plants although adaptable, may be suffering some kind of confusion. 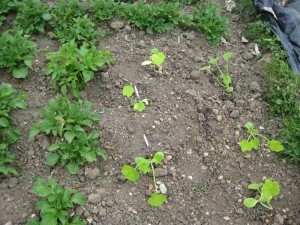 If the Climbing Beans do not start to look more vibrant in the next seven days, more Beans will be planted directly in to the Plot. The temperatures at night, on several occasions recently, have dipped down close to freezing point and this will inhibit or damage plant growth. Because of the instability of the weather conditions Ella Montt decided to place the first Tomato plants transplanted to the Plot between the row of Herbs and the netting that shelters the Peas. The Tomatoes were planted in the following order: 2 x Brandywine, 1 x Chadwick, 1 x Koralik, and 1 x Marmande. More Tomato plants were growing back at the fixed up greenhouse and will be added to the Plot at a later point in time. 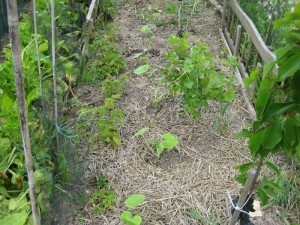 The sprouting Sweet Potato was planted inside the netting between the Tomatoes and the Peas. 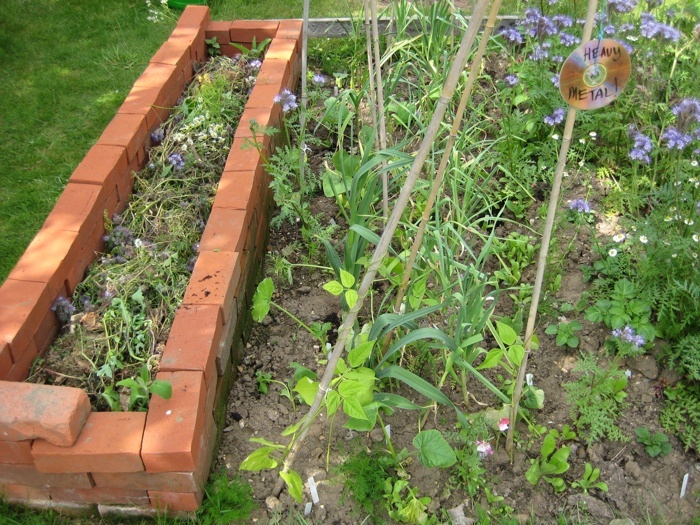 The rooting Comfrey was planted in the Brick Composter at the opposite end to the first Comfrey plant and the Stinging Nettle. Ella Montt did not transplant herself but kept her same identity. More snails were found between the Peas. The netting was sheltering the plants from bird attack, but also providing a breeding ground for snail activity. The first harvest of Broad Beans and Peas commenced: Broad Bean Supersimonia = 1lb 3oz = 480g; Broad Bean Super Aquadulce = 6oz = 160g; Peas Meteor = 5oz = 140g. 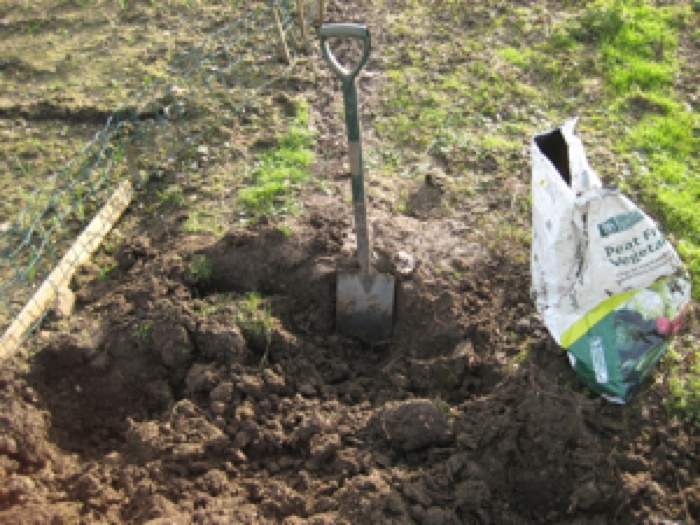 22nd May 2011 – The garden fork broke at Allotment Plot 326. It shattered whilst digging. 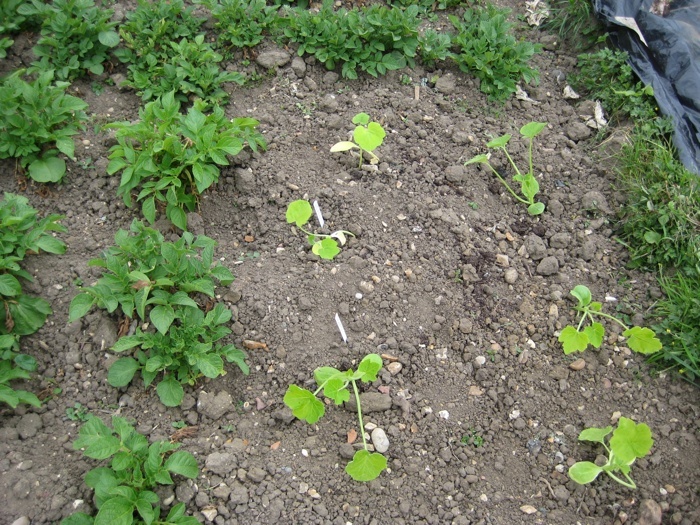 The first transplant of Squash and Courgette plants arrived at the Plot 326, more will follow at a later date. Plants placed in the earth that day were: Squash 1 x Big Max, 3 x Butternut; 3 x Marrow Long Green Bush; 5 x Courgette Black Beauty; and 3 x squash or courgette that had somehow lost their name label. Water was applied to the Plot. Wind damage may occur over the next two days. 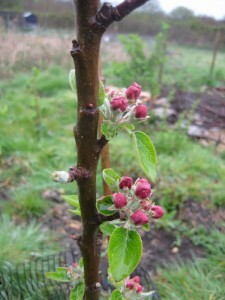 A single Plum and a single Apple on the new fruit trees were germinated and have survived so far. The strong winds will test the strength of the fruit. 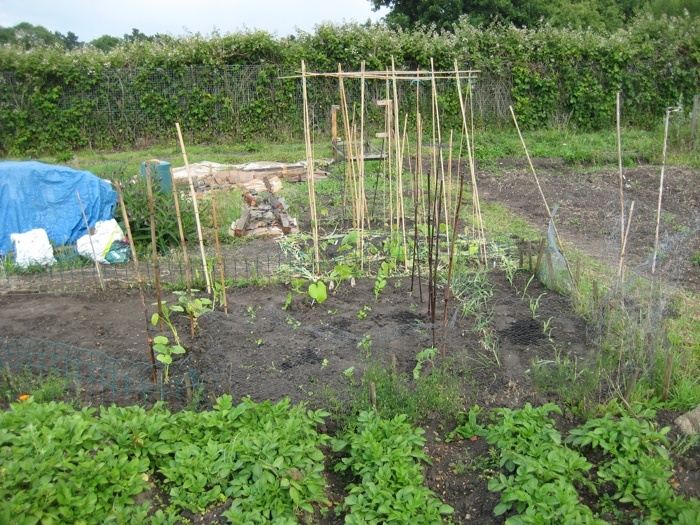 Harvest at Allotment Plot 326: Broad Beans = 1lb = 440g and Spinach 4oz = 110g. 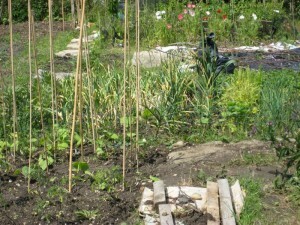 This entry was posted in Allotments, Harvest, Plant, Planting and tagged Allotments, Harvest, Plant, Plot, Sweet Potato, Transplant on May 23, 2011 by katecorder. A solitary white root has appeared on the one remaining (the third) Sweet Potato that sits in a glass jar of water on the table in the studio. The Sweet Potato will need to grow more roots and then it should grow Slips, which are the leafy shoots of the vine. 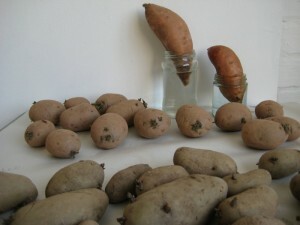 They can be cut off and planted separately and more Slips should grow once the Sweet Potato is in full production. Ella Montt has no previous experience of successfully growing Sweet Potatoes so the prospect of progression is tentatively awaited. D&G were seen peering through the studio window discussing the single root. This entry was posted in Growing, Plant Life, Root and tagged D&G, Root, Sweet Potato on April 10, 2011 by katecorder. A potato is a tuber. Deleuze and Guattari define tubers as rhizomes. The Potato, Solanum Tuberosum, (as opposed to the Sweet Potato) is part of the Nightshades family. The potato as a plant has a long history. It originates from Peru. 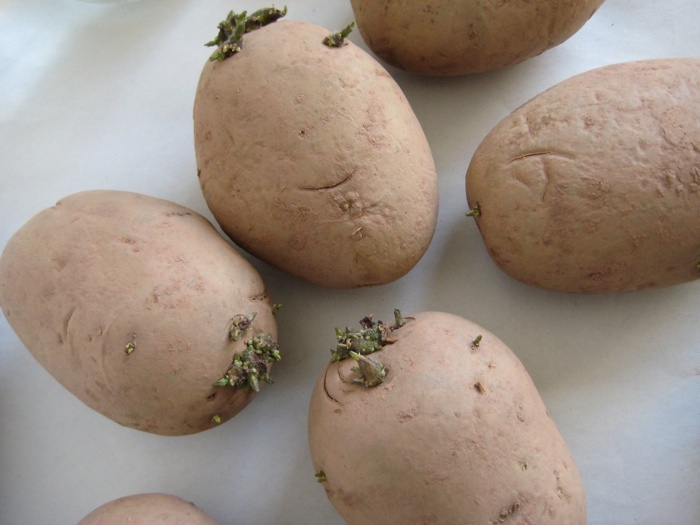 Humans discovered the potato and begun to cultivate it at least 7,000 years ago. The Spanish Conquistadors were the first Europeans to come in contact with the potato in the 1530s after searching for gold and fighting the Inca’s in the Andes. (Ella Montt muses, invasion and conquest of a country is that not illegal? And the Inca’s would not even have had fictional or actual weapons of mass destruction!). The potato was brought to Europe by humans in 1570 (approximately). Spanish sailors on ships who ate potatoes did not suffer from scurvy. The nutritional content of this tuber is very high, unlike the plant leaves which are poisonous. 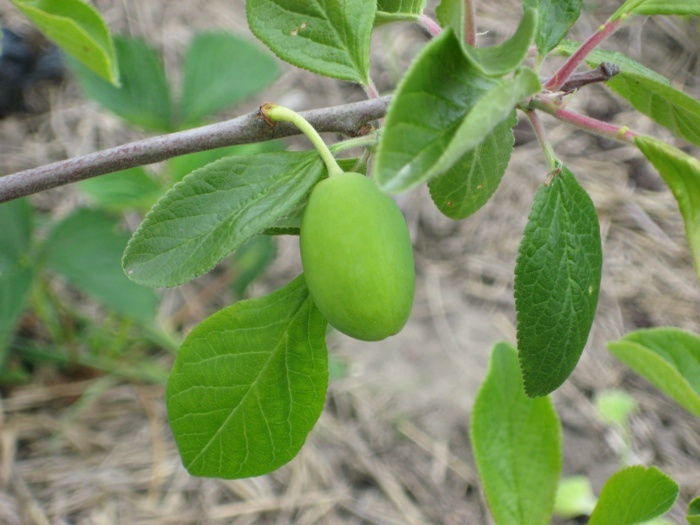 Many humans in Europe, at first distrusted the plant, because they were unaware of the sickness the foliage could induce and also because the tubers were not attractive to the visual senses. The potato is said to have washed up on the shores of Ireland after a Spanish ship was wrecked. 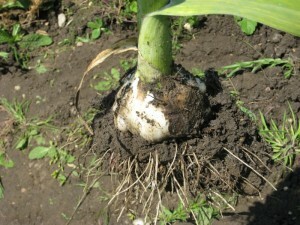 Gradually the plant became more accepted, and the human became very dependent on the tuber as a source of nutrition. More humans could be fed by growing potatoes than through other forms of agriculture. 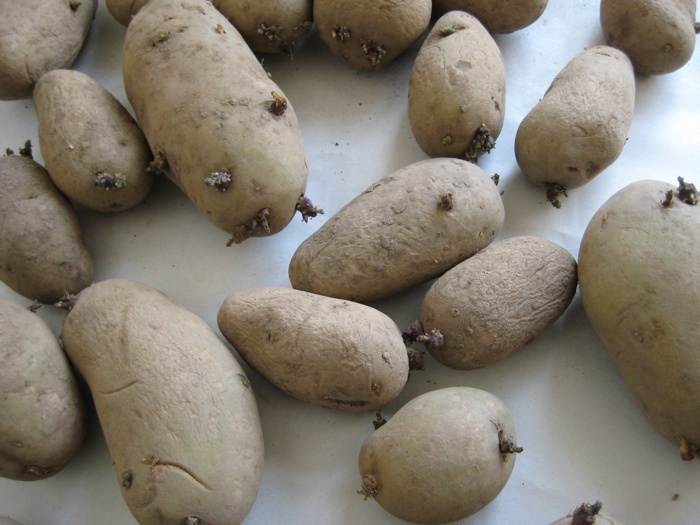 Potato blight, which is a type of fungus, destroyed crops between 1845-1852 in Ireland, the Scottish Highlands, and other parts of Northern Europe. The potato blight caused famine, death through malnutrition and emigration to escape these conditions. The blight eventually dissipated and the potato crops became healthy again. 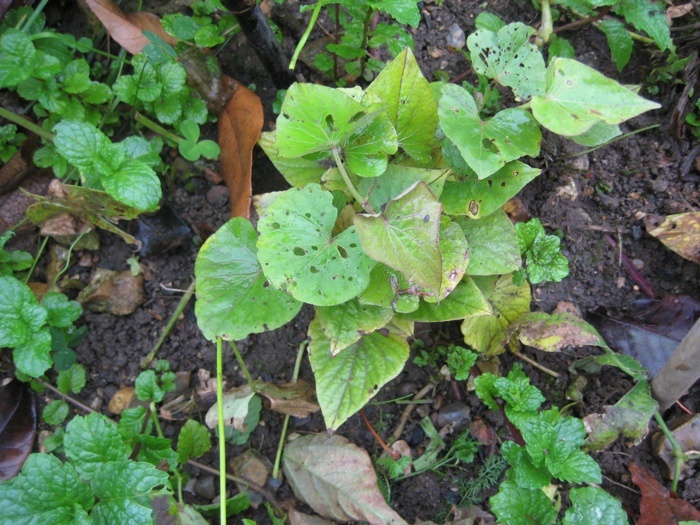 The Sweet Potato tuber grows on a vine and the foliage (Ella Montt has read), is also edible. Sweet Potato is botanically known as Ipomoea Batatas and is related to the Morning Glory family. Some sweet potatoes can also be poisonous, but not the Batatas. Sweet Potatoes stem from the Southern regions of the New World, (continent of America). Columbus is said to have brought the Sweet Potato to the northern part of the New World, the Potato arrived almost one hundred years later. The Sweet Potato should not be confused with the tuber known as the Yam, Dioscorea Batatas, which is another type of vine altogether. 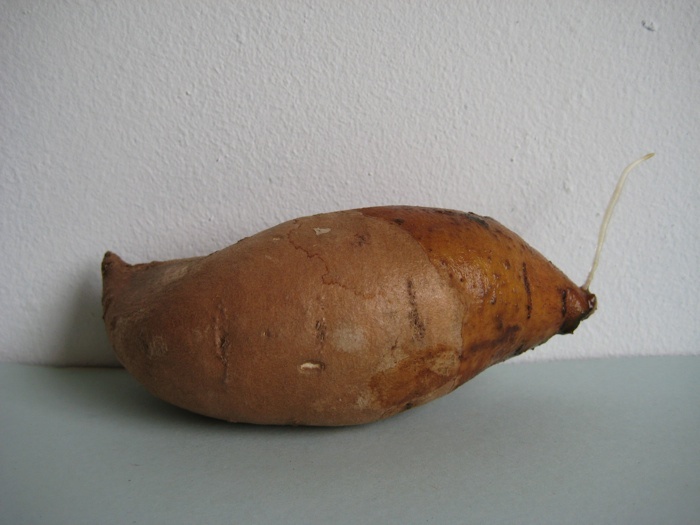 The Yam is sweeter, has skin that resembles bark and can grow to almost two meters in length. Europe still has a very small Sweet Potato production, however production and consumption is prolific in many other parts of the world. The plant is not frost tolerant, it can be grown as a perennial under the right conditions, or failing that as an annual. 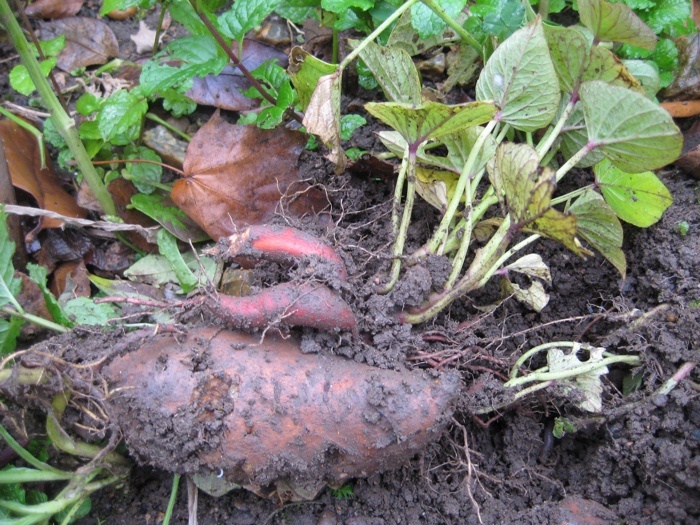 Ella Montt had tried to grow Sweet Potatoes on Allotment Plot at MERL in 2010, but the methodology that was used was faulty. 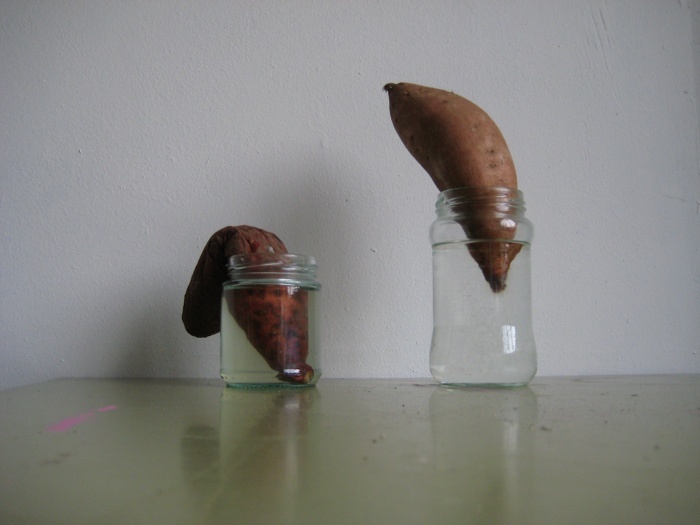 On 9th February 2011, Ella Montt once again started her quest to grow a Sweet Potato. 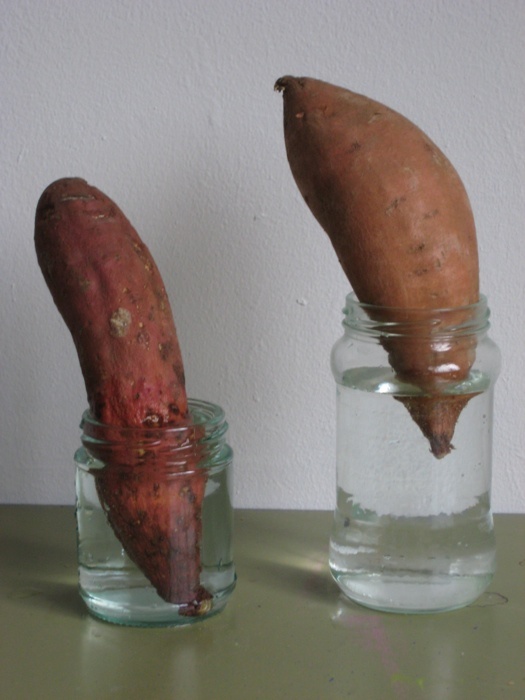 She assembled two Sweet Potatoes and water in clear glass jars and placed them in the studio with available light and heat. 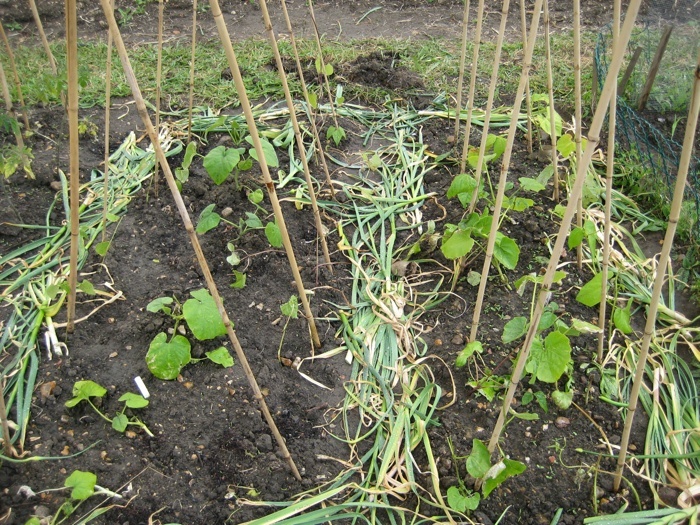 Sweet Potatoes can grow slips (white shoots) in this way that can then be used to grow the plant. By the 18th February, one of the Sweet Potatoes had demised, but the other remained constant, yet without slips. The collapsed Sweet Potato had turned soft. It was removed and retured to the compost. On the 22nd February a quantity of Potato Madeleine were placed on the table to chit next to the Sweet Potato. The Sweet Potato had started to produce a plume around the end submerged in water, but as yet no slips. 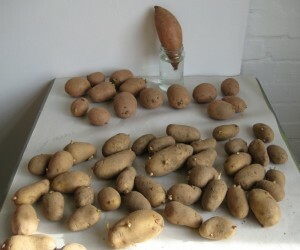 Two days later, on the 24th February, a larger quantity of Potato Charlotte were also placed on the table to chit. Bother Madeleine and Charlotte are early cropping potatoes. 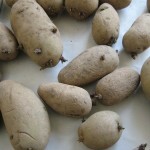 Early potatoes can be harvested in June, which avoids blight that could come later in the growing season. 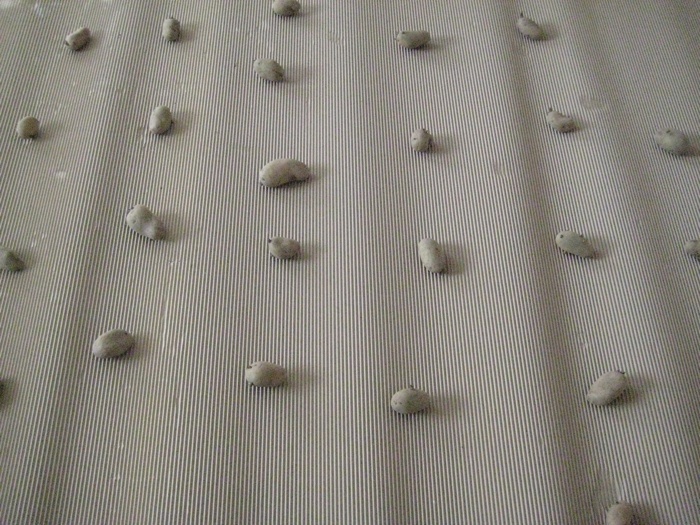 When the potatoes are placed in the light to chit they start to grow green shoots which promotes their growth. It is not essential to chit Main Crop potatoes, because they take longer to develop and will be dug up later in the growing season. 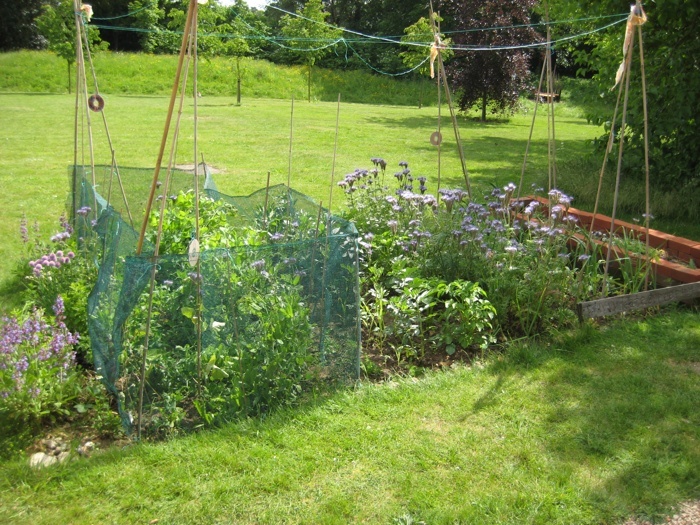 Bob Flowerdew advises that you can plant all varieties of potatoes out as soon as the weeds start to grow, (Go Organic, 2002, p92), Ella Montt will be aiming to plant out both the Early and Main Crop potatoes in mid March, but it will depend on when the ground is ready at the Allotment Plots. By the March 8th, the Early potatoes in the studio were sprouting small green chits. 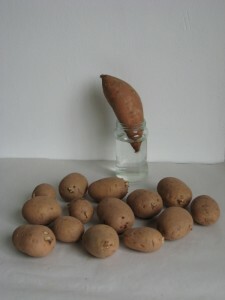 Ella Montt added a new Sweet Potato propped in a jar of water to the potato field in the hope of growing slips. 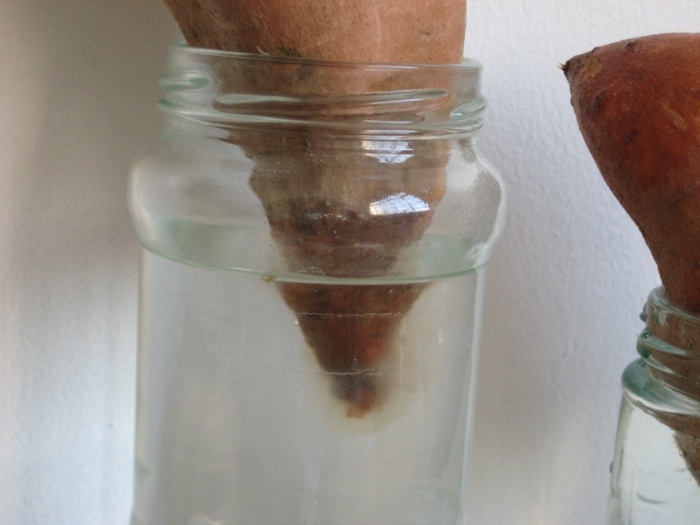 The first surviving Sweet Potato continued to grow a plume in the water, but as yet no visible slips. Bob Flowerdew advises in grow your own, eat your own, (2008, p165) that Sweet Potatoes can be grown as a vertical vine. According to Bob, there is no need for the haulm (stalk or stem) to grow rooted across the soil, because it dissipates the energy of the plant. Ella Montt has observed different accounts on growing Sweet Potatoes, and knows that they can grow to cover a wide ground area. If the slips are formed and Sweet Potato plants are able to be grown, Ella Montt will experiment with both methods of cultivation. 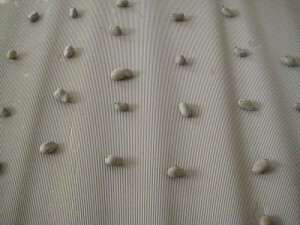 Ella Montt removed the quantity of Potato Charlotte to a large sheet of corrugated cardboard that was spread across the studio floor. Each potato was placed approximately 30cms away from each potato as if the potatoes were planted in the position to grow on the potato field. 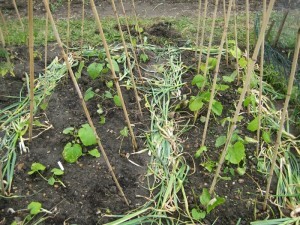 Ella Montt left the studio and went to dig at Allotment 326. The ground was in much need of prepartion for the future event of potato planting. This entry was posted in Allotments, Plant, Plot and tagged Allotments, Bob Flowerdew, Chit, Potato, Studio, Sweet Potato on March 13, 2011 by katecorder.